Neutralizes OC pepper spray and CS, CN tear gas when running water is not available. Sudecon will neutralize and wash off pepper spray from your eyes and skin if you follow the simple directions. Sudecon wipes are the antidote for pepper spray and will quickly ease the pain and burn and decon your face. Follow the instructions on the package for the best relief.Sudecon Decontamination Wipes drastically improves recovery time from exposure to pepper spray, CN and CS tear gasses as well. The patented formula in Sudecon� wipes works faster and more consistently to decontaminate individuals exposed to OC, CS and CN than any other decontamination product ever formulated! It strips the chemical agents from the skin instantly and takes away the 'burn' and opens the eyes in just 7 to 15 minutes-or less! With the many different brands of OC and OC/CS on the market today, there are surprisingly few solutions�other than large amounts of cold water. Fox Labs, a Michigan-based manufacturer and an international marketing company, has introduced Sudecon, a wipe which decontaminates (without water) a person sprayed with OC and CS. Similar to a wet wipe you get at a restaurant, Sudecon is a cloth-type paper wipe (towelette) 7 1/2 X 11 1/2 inches containing a non-tearing liquid solution. 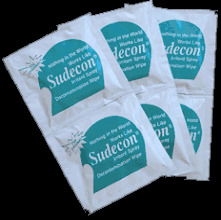 Sudecon packets are sold individually, and you will need at least two packets to complete the decontamination process. The directions are easy to follow. First you tear off the top portions of a pouch and remove and unfold the damp cloth. Immediately place the towelette over your face and thoroughly wipe the OC and CS off your face, eyes, nose and mouth (you may notice the white towelette change color�this is the OC/CS being removed). With eyes closed, using a second fresh towelette, squeeze towelette over the eyes allowing membranes to absorb the solution. (Squeeze towelette to extract solution.) It is of the utmost importance to squeeze the towelette over the eyes while allowing the liquid to flow around the eyes. After doing so, lay towelette over face to soothe burning sensation. Then continue to wipe the OC and CS off your face, concentrating on your eyes, nose and mouth. Do this until you can voluntarily open your eyes. Do not use water with the towelette; it will only dilute the decontamination formula. Note: Some of the OC and CS will still be in your respiratory system, but you will experience a recovery of vision and the coordination of your eyes within 7 to 15 minutes. I received outstanding results when evaluating Sudecon. None of the subjects assisting me had ever been exposed to a chemical agent. All were sprayed using one to three bursts (1/2 to 1 second). Every subject sprayed stayed contaminated for a period of about five to seven minutes to simulate the time it would take a law officer to control, handcuff and search the contaminated subject. The OC products used were MSI foam; Def-Tec Stream; PRO-AER fog/cone; Bodyguard stream; Punch fog/cone; MSI fog/cone; First Defense fog/cone; FOX stream; Cap-Stun stream and MSI OC/CS fog/cone. The average recovery time (the amount of time it takes to be able to voluntarily open the eyes) was between 12 and 15 minutes. The fastest time we had was 7.5 minutes and the longest was 14.92 minutes. Sudecon Wipes are a definite benefit to law enforcement agencies who deploy the use of OC, OC/CS or other chemical deterrents. With Sudecon�s convenient packaging, an officer can easily carry a couple of packets in a pocket. Sudecon provides the officer with the most effective product available to decontaminate a suspect sprayed with OC, CS or CN. It also assists the officer in being able to quickly decontaminate themselves, their equipment and vehicle after they have used a chemical spray. Simply the best anti-pepper spray product available.